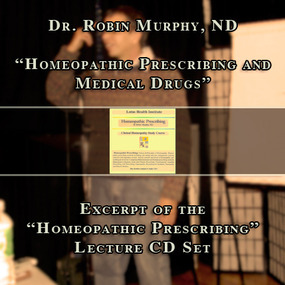 This podcast is an excerpt from Dr. Robin Murphy, ND's "Homeopathic Prescribing" Lecture CD Set. Dr. Murphy speaks on Homeopathic Prescribing and Medical Drugs. History and principles of homeopathy. Homeopathic prescribing methods including case taking and case management, potency selection and repetition of dose. Various schools and levels of homeopathic prescribing are reviewed. Comparing Hahnemann and Kentian prescribing methods. Hahnemann's Organon, acute and chronic prescribing, constitutional, isotopic prescribing, LM describing, organopathic, psychological, synthetic, tautopathic and materia medic.